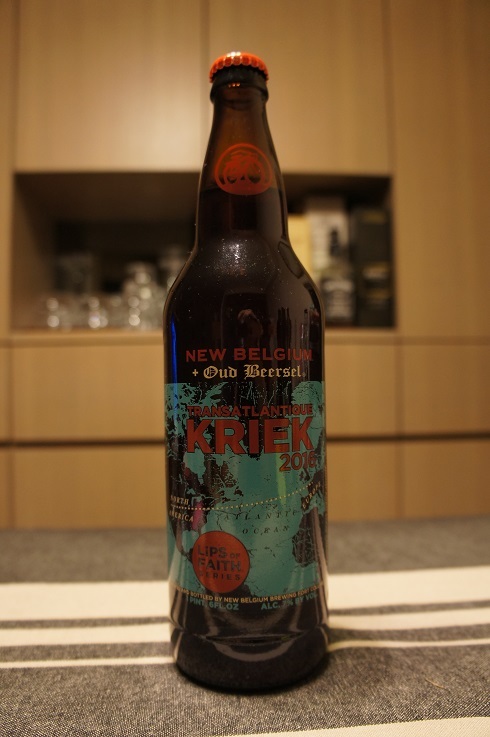 Brewer Description: (from bottle) A Kriek of two continents. Behold the fruit of our collaboration with Oud Beersel of Lambic brewing fame. Their Kriek, a cherry-spiked Lambic travelled from Belgium to be united with New Belgium’s specially brewed Golden Ale, as well as Wood-Aged Sour beer pulled straight from our foeders, for a blend of sour cherry bliss. It’s a new legend waiting to be poured. Intro: A 22 fl. oz. bomber, 2016 vintage. Poured into a 3 Fonteinen stemmed glass. Appearance: A lightly hazy ruby red colour with an almost two finger whitish pink head that had pretty good retention and left some nice curtain lacing. Aroma: Lots of cherry, lifesaver cherry hard candy with perhaps a touch of oak. Taste: Sweet and sour cherry, lightly candied, oak, but flavours overall were a bit soft. Mouthfeel: Light to medium bodied with moderate to soft carbonation. Overall: Aromas were great, but flavours while good, were a little too soft on the palate for me. Also, not a lot of funk in the aroma or flavours, which is not a problem for me, but just a comment since I was expecting some.